What’s the best way to measure antenna performance? Without a doubt, the best way to measure an antenna’s performance is the use of a good signal meter. It’s not just raw signal strength… you can find that out with a cheap signal finder. With digital signals you really need a meter that will decode the signal and tell you what’s really going on with in. 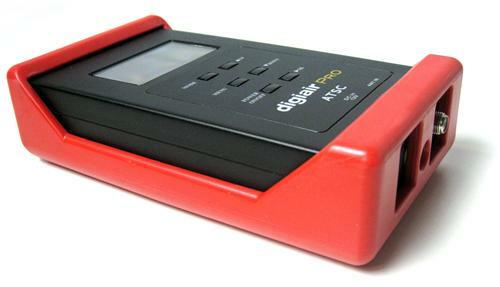 This DigiAir Pro meter does a pretty good job with that stuff, although it pales in comparison to the tools the professionals use. It’s good enough for the average DIYer, though. The real question, though, is “will lab tests tell you how well an antenna will perform?” and the answer is definitely “no.” A lab test will tell you how well the antenna performs in a perfect environment and that’s great for comparing antennas. It’s a real challenge figuring out how well an antenna will work in your own home. When I test antennas, I try to get real lab data from the manufacturers but sometimes it’s a challenge. Some of our past suppliers have obviously lied about their specs, and that’s why we don’t sell their products anymore. I know that my friends from Televes do a great job testing their products because I’ve seen their labs. I mean, they build their own signal meters, so they must have some idea what they are doing. But really, the meaurements I trust are the ones I do myself. That’s right, I do my own testing on every antenna I review. I don’t have a $100,000 facility but I do have some consistent locations and I’ve developed procedures to make sure that it’s as scientific as possible. My favorite test lab is our Southern California facility because it has the perfect combination of test conditions. It’s about 60 miles from the towers, meaning that it really tests the ability of an antenna to receive signals. The weather is pretty much the same year round and the facility doesn’t have a lot of trees. There are also about 25 broadcast channels including 3 VHF so I can really test a lot of different frequencies. I always start with a baseline test using a 1-meter dipole that I built out of copper wire. I’ll admit that it isn’t a perfect antenna to test with. The perfect scenario would have me put together an antenna for every frequency I’m testing, with the length of the antenna being half the length of the broadcast wave (they call that a half-length dipole, for obvious reasons.) But that’s a lot of copper and a lot of time and a lot of space to store 25 different antennas. Maybe at some point. Anyway, what I do is take measurements of that bare copper antenna on the day I’m doing testing. I aim it to get the strongest signal from the location where most of the signals originate. Then I do the same thing with the antenna I’m testing. Subtract one set of numbers from the other and you get a set of gain numbers. I admit that there are some flaws here. The bare wire antenna is going to be more sensitive on some frequencies than others, and that’s going to make the other antenna look less sensitive by comparison. It’s also impossible to completely duplicate results in real-world testing — I’ve seen signal levels vary by 4dB just as you’re sitting there reading the numbers. But this gives you an idea of real-world, outside the lab performance and as far as I know no other antenna merchant does this. In past years I’ve stopped there, only measuring signal levels, even though it’s arguably the least important measure of antenna performance. I’ve recently upgraded to a Televes H45 Advance meter, however, which can measure signal level, bit error rate, signal-to-noise and carrier-to-noise ratios, all at once. It sends the results straight to Excel which makes it easy to truly measure antenna performance. Best of all it gives me this data in about 1/10th the time it took with my old testing rig. This should allow me to get much better results compared to my older method and I will start publishing new charts as I get new antennas to test! What is the skin effect?